Kevin Truong (BA, Law, Societies & Justice, 2016) was determined to become the first in his extended family to attend college. He achieved his goal, earning a UW bachelor’s degree in 2016. But he’s never forgotten the stress of navigating the college application and financial aid process. That experience inspired Truong to create Hey Mentor, an online mentor program for high school students. Since its launch in fall 2017, Hey Mentor has served students from more than 20 high schools in King County, and has earned the attention and support of the Gates Foundation. Truong had years of experience with college readiness programs before launching his own. As a UW undergraduate, he spent four years volunteering for The Dream Project, which supports college access and post-secondary planning for middle and high school students. After graduating, Truong became a full-time college access coach at Seattle’s Chief Sealth High School — his alma mater — through AmeriCorps’ College Access Now program. He wanted to continue exploring college readiness as a career path but noticed shortcomings in existing programs, particularly their struggles to retain mentors and high school participants. I decided to...[use] my experience to do something innovative and different than what was currently being offered. Participants and mentors gathered for a photo on Hey Mentors' Mock Admissions Day 2018. Through Hey Mentor, students are assigned an online mentor whom they can contact with questions or concerns at their convenience. The mentors are college students or recent college graduates trained in college access issues — the admissions process, financial aid — as well as social and emotional aspects of mentor relationships. When possible, mentors are paired with high school students with similar career interests. Truong began planning Hey Mentor while wrapping up his year-long AmeriCorps stint at Chief Sealth High School. He invited Chief Sealth students to brainstorm with him, meeting with them weekly during the spring and summer. Together they developed a plan for recruiting high school students, a curriculum for training mentors, a name for the program, and a logo. By fall 2017 — when Truong returned to the UW to begin a master’s program in public administration— he had filed for nonprofit status and created a Hey Mentor board. A mentor talks with high school students at a Hey Mentor college application workshop in November 2018. 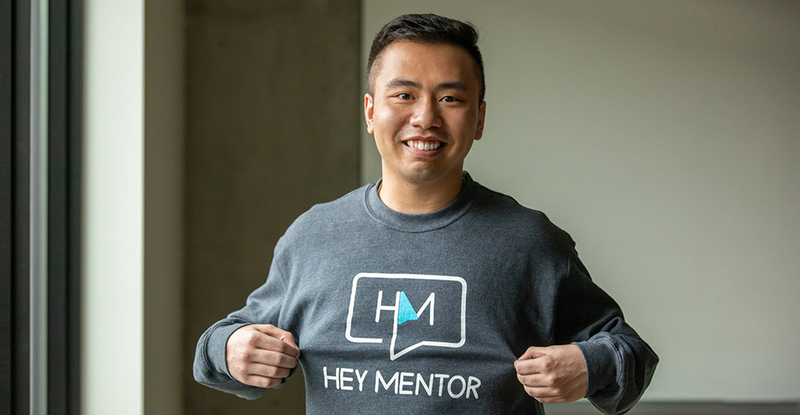 Thanks to Truong’s many connections at local high schools and with former college readiness mentors, he was able to launch Hey Mentor that fall. He formed a technology team to develop a mobile app, and a new Hey Mentor student club at the UW recruited and trained more than 30 additional volunteers. Student ambassadors from a dozen Seattle-area high schools spread the word about the program, and a $15,000 grant from the Gates Foundation led to more program refinements. As if juggling graduate school and Hey Mentor wasn’t enough, Truong also worked as an admissions reader for the UW Office of Admissions in autumn 2017, which meant reading upwards of 1000 college applications over three months. The experience gave him a greater understanding of what admissions staff look for in applicants, and became one more way to help high school students. “I’ve never shared any trade secrets with applicants,” Truong assures. “I was very transparent with Admissions about my dual role.” Hey Mentor is now an affiliated program with UW Admissions. Beyond online mentoring, Hey Mentor now offers hands-on workshops, including a college application workshop for high school seniors and a mock admissions day for juniors. For the latter — Hey Mentors’ most popular event — high school juniors complete an abbreviated college application, then learn from mentors what they can do to improve their chances of acceptance at selective schools. Truong hopes Hey Mentor can continue to broaden its reach, with Hey Mentor clubs at other universities in Washington state and beyond. Given his own background, he understands what a difference a little help can make.